The industrial catalysts of the future won't just speed up reactions, they'll control how chemical processes work and determine how much of a particular product is made. A team of researchers led by Phillip Christopher, assistant professor of chemical and environmental engineering at the University of California, Riverside's Bourns College of Engineering, demonstrated this — as well as how these catalysts look in action — in a paper published Monday, Sept. 19, in the journal Nature Chemistry. 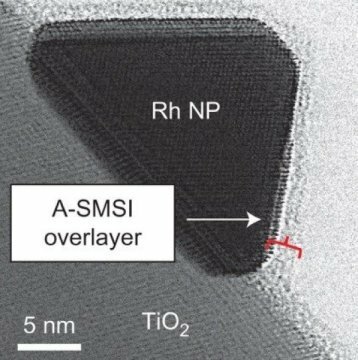 Titled, "Adsorbate-mediated strong metal-support interactions in oxide-supported Rh catalysts," the paper describes a new approach to dynamically tune how a catalyst operates, enabling the researchers to control and optimize the product made in the reaction. The team, which includes scientists from the University of California, Irvine and Columbia University, also used advanced microscopy and spectroscopy approaches to view the catalyst in action on an atomic scale. The researchers focused on an important chemical reaction that involves the conversion of carbon dioxide to carbon monoxide and synthetic natural gas. The benefits of this reaction are two-fold: it offers the potential for the removal of harmful carbon dioxide from the atmosphere, and the carbon monoxide and natural gas produced can be used as a chemical precursor and fuel, respectively. The team focused on understanding how the catalyst drives the reaction at the atomic scale, which will allow researchers to modify the catalyst's properties to increase efficiency in the reaction. Christopher said the findings unlock new opportunities for carbon dioxide conversion chemistry, and the dynamic tuning and visualization techniques demonstrated in this research could be replicated in a variety of other important chemical processes. "The real uniqueness of the paper was being able to observe what was happening at an atomic scale and how physical changes in the catalyst affected the outcome of the carbon dioxide conversion reaction. The insights we gained pave the way for the design of more effective processes to produce fuels and chemicals," Christopher said. The above post is reprinted from materials provided by University of California, Riverside. The original item was written by Sarah Nightingale. Note: Content may be edited for style and length.